Something that has been around for quite some time now, which I personally feel deserves much more praise, is the Bamboo Pillow, or alternatively Bamboo Pillow Casing and Cover. Bamboo is an all natural fiber with so many exceptional health benefits, and to top it off it is a completely vegan and cruelty-free product that is healthy not only for you but the environment as well. Before we start, let’s just set the facts straight, Bamboo Pillows are called such, because their cover, and not the fill of the pillow is manufactured from woven bamboo fibers. The Pillow itself is usually filled with latex or memory foam, or even other natural fillings such as Buckwheat or cotton. Likwise, Bamboo Pillow Covers are more Popular, and to be much more useful, as they allow you to choose your pillow option. Most bamboo pillows are filled with high quality and supportive fill that provides excellent support, as well as good back and neck alignment. Bamboo is a natural antimicrobial and antibacterial fiber which creates a healthy environment for you to sleep on. Bamboo is likewise hypoallergenic and ideal for individuals who suffer from allergies. Dust mite accumulation will also be a thing of the past when it comes to bamboo pillows. 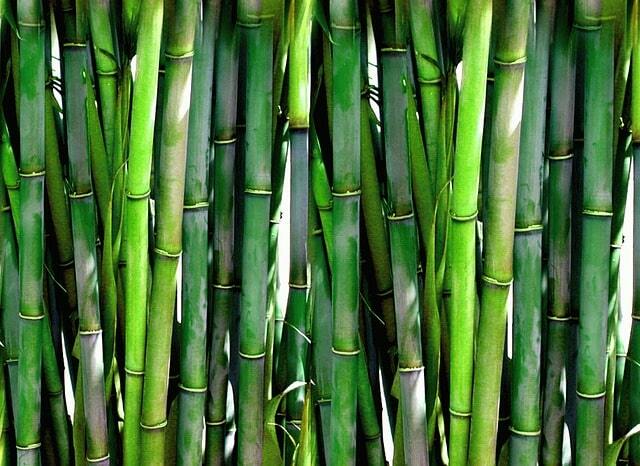 Bamboo itself is very absorbent so will aid to wick away moisture from your skin. Last but not least, bamboo pillows have the ability to control temperatures, keeping your cool in summer and warm in winter time. Your sleeping position does affect your choice in the pillow in a significant way. As all bamboo Pillows only have a Bamboo casing or cover, you still need to consider the filling. When sleeping, in whatever position is most comfortable for you, the main factor is for your head, neck, and shoulders to be perfectly supported, and your spine correctly aligned. For this reason, every sleeping position requires a certain pillow type or loft. When laying on your back, your spine is in a more neutral position and your head needs to be kept level with your shoulders, so flatter and a less firm pillow is required. Sleeping on your stomach, is not good for your spine any which way, although for the best results a very thin and soft pillow is required keeping your head and neck as flat as possible. Last but not least, the most common sleeping position, side sleeping. For this position you need to keep your head neck and shoulders completely level for the best support, here, unlike with back and stomach sleeping, you need a more firm, contoured and thicker pillow. A supportive fill for your ideal sleeping position requirements. High-quality construction with pure natural bamboo fibers. A soft and textured feel casing or cover. Here are a few top quality and much sought after brands and models of Bamboo Pillows. The Xtreme Comforts Bamboo Pillow has a quality Memory foam fill and features exceptional cooling technology which allows for better ventilation and breathing properties. A fully adjustable pillow, which is ideal for all sleeping positions. Zipper closure allows you to open the pillow and remove or add fill. Filled with high quality shredded, CertiPUR-Us Certified, memory foam. Contoured design to fully support your head and neck, for better spinal alignment. Micro-Vented Kool-Flow technology for better breathability and circulation of air. Hypoallergenic and cooling Bamboo fabric casing that is completely machine washable. Plixio brings you the plush queen-sized, shredded memory foam pillow, with a hypoallergenic, pure and natural Bamboo casing. Filled with fine quality shredded memory foam. Cooling and breathable Bamboo casing that’s is similarly hypoallergenic. Alleviates pain, tension and other ailments such as snoring, and insomnia. Offers firm yet pliable support and comfort. A cool and comfortable pillow from Original Bamboo that offers you superb medium support with all the health benefits of pure and natural Bamboo. Available in a standard and queen size. An Original Bamboo pillowcase that is cooling, breathable and hypoallergenic. Filled with shredded, PandaPedic memory foam, offering medium firm support for all sleep positions. Completely dust mite, mold and bacteria resistant. The JL Home Collection Bamboo Covered Memory Foam Pillow comes in a convenient single or two pack, in a king and queen sizes, for superior comfort and quality. Covered with a Bamboo and brushed Microfiber cover that is soft and comfortable. The Pillow is filled with premium shredded memory foam for plush and comfortable support. Completely odor free and breathable, with excellent cooling technologies. Adjustable loft to get just the right firm support. Hypoallergenic, Dust Mite, Mold and Mildew resistant. The Wonder Sleep Premium offers you a Hotel quality hypoallergenic memory foam pillow with a cooling Bamboo cover for superior comfort and support. Bamboo Rayon blend cover that is cooling and hypoallergenic. Filled with shredded memory foam for personalized support and pain relief. Completely dust mite and allergen resistant construction, for undisturbed and healthy slumber. A zippered cover so that you can adjust the loft. Both the cover and pillow are machine washable. Snuggle-Pedic is top quality and well-known brand when it comes to pillows and bedding alike. The Original Memory foam and Bamboo Pillow is one of their top models and most sought after Pillows. Filled with CentiPur-US Certified Shredded Memory Foam that is naturally derived and Eco-Friendly. Hypoallergenic, and Dust Mite resistant, with the addition of Biogreen materials in the fill. Completely chemical and ozone depleter free for a natural and safe alternative. No zipper design with a natural and quality Bamboo casing that has Kool-Flow technology keeping you cool and comfortable. Bamboo is a soft and comfortable material, with plenty of health benefits to improve your sleep patterns and ensure that you are cool and comfortable all night. Clean, durable and hypoallergenic, with superior resistance to mold, dust mites, mildew and allergens, what more could you ask for.